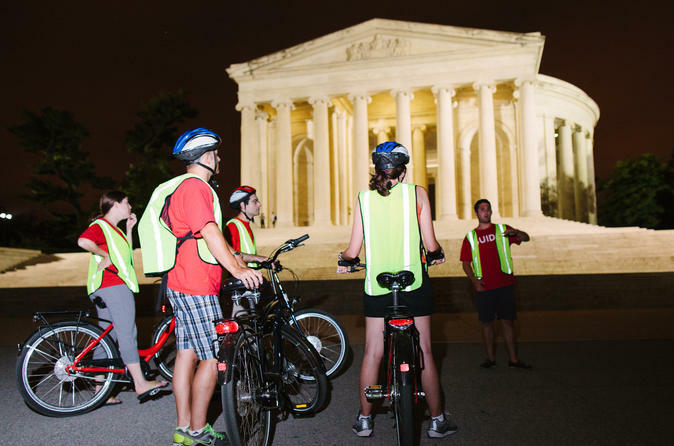 See it all on the National Mall with an electric bike tour as the sun sets over the Nation's Capital! With an e-Bike, you can cover more in three hours than any other tour. You'll visit the White House, Pennsylvania Avenue and tons of beautiful Monuments and Memorials lining the National Mall while your guide fills you in on the best history, urban legends and anecdotes the city has to offer. In the evening, meet your guide at the departure point for your tour. With the help of e-bikes, you'll cover a lot of ground in a small amount of time. These e-bikes have a small motor to help power you, meaning you'll be able to go farther with less effort! These may be new, but they're easy to learn. After a brief orientation, you'll be riding like a pro in no time. Your expert guide will guide you around the National Mall, visiting the White House, the National Mall, Pennsylvania Avenue and plenty of other Monuments and Memorials. You'll be filled with the best history, urban legends, and fun stories that DC has to offer. After three hours of sightseeing you will return to the original departure point.